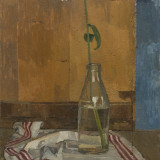 Uglow studied under Coldstream initially at Camberwell and then at the Slade where Coldstream was Professor from 1949. Even amongst a young group of exceptional painters including Craigie Aitchison, Michael Andrews and Howard Hodgkin, Uglow was immediately recognised as a precocious talent. The relationship of teacher and student evolved from friendship into one of mutual influence and sustained inter-generational artistic dialogue. Working with restraint and exactitude, paintings by Coldstream and Uglow are masterpieces in rigorous refinement and quiet passion. Informed by an artistic heritage of concern with rigorous and reflexive formal construction, looking to Piero della Francesca, Cézanne and Giacometti. Coldstream and Uglow sought to reveal a logical order underlying the visible world. Driven by the conceptual challenge of reconstituting rather than imitating reality in painted form, Coldstream and Uglow's interrogation of perception left a lasting legacy upon figurative painting. Both renowned for their painstakingly methodical painting processes, neither was prolific and thus their works remain rarities, infrequently seen. 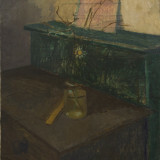 Bringing together a carefully curated selection of significant works, William Coldstream | Euan Uglow: Daisies and Nudes will present paintings and drawings from private collections, many of which will be offered for sale, and loans from public collections. The exhibition is accompanied by a fully-illustrated catalogue. For a list of available works and a catalogue please contact the gallery.